Standardized testing can be a hot topic among parents of any student, homeschooled or not. I'm not intending to argue the merits or pitfalls of the process, but simply discuss our experiences with testing and consider Amber's future testing. Amber has not always been homeschooled. In fact it was a decision made after years in two different parochial schools. Both schools administered the Stanford 10 test to their students, first through eighth grades. By the time we removed Amber from parochial school in January of fourth grade, she already had several years experience with both the Stanford 10 and OLSAT (associated ability test). We decided to continue the testing, for at least that fourth grade year, and I quickly became certified to administer the tests. Our motivation was primarily out of fear intially. Our state has no testing requirements whatsoever. We've never needed to submit Amber's scores to any person or entity. However, we met with some negativity from the last school when we withdrew Amber and decided it might be best to show she was still progressing despite their thoughts on the subject. For the fifth grade year we again chose to continue testing, but this time it was mainly for ourselves. We wanted to be able to compare her results from all the previous years to new results after being homeschooled for over a year. Amber was also able to continue having experience with testing procedures. I will admit the testing that year pointed out the weakness in one of our selected curricula and demonstrated Amber's need to go further than grade level books. We have continued yearly testing with Amber through this current seventh grade year. 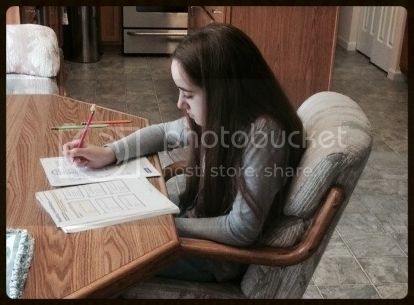 I did consider foregoing the testing after sixth grade, but with Amber's chronic illness we wanted to know if it was affecting her overall learning ability and not just a day-to-day comprehension issue. We do not in any way teach to the tests and some of the topics covered in the tests have not been visited in our schooling during the current year. For example, we study one major science topic a year, instead of grade level science books that do an overview of biological and physical sciences each year. This brings about some concerns over the validity of the tests. 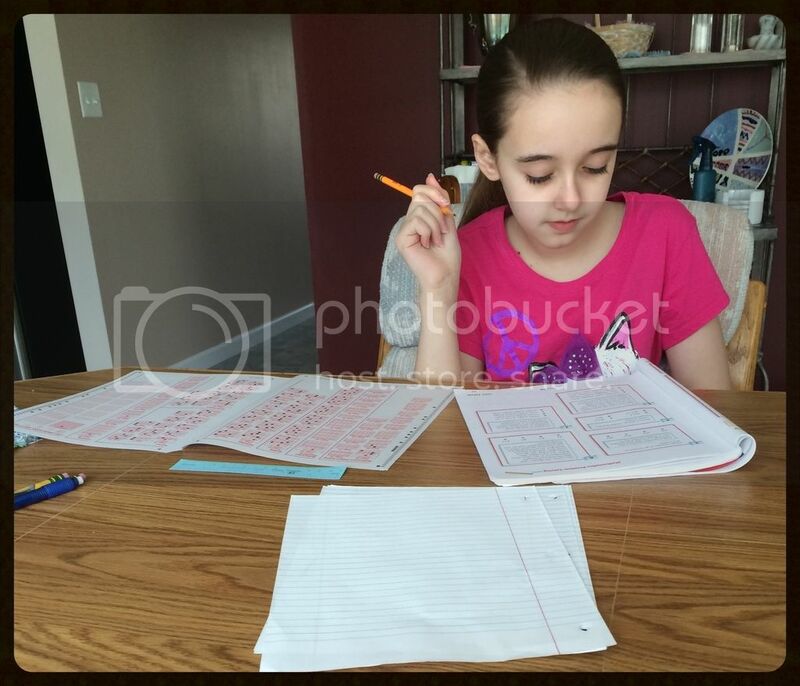 Since the fifth grade testing, every year Amber has scored 99th percentile on over half of the subtests. Her ability test (OLSAT), while always high, has been 99th percentile for two years running now. In actuality, from this year's results she can't score any higher on the OLSAT. So what will these tests really show us in the future? All of Amber's subtests also show her Grade Equivalent (GE) to be post high school. We we realize that does not mean she's working at a post high school level. It's not an indicator of grade level work, since she was not tested on anything other than her current grade level material. However, it does mean she earned a score of what a person post high school would earn when tested on seventh grade material. Amber has a complete and full understanding of the standardized test seventh grade topics, which we already knew. Given that the purpose of the GE statistic is to show educational growth, we are at a loss as to why we continue to test. Amber has been post high school on the majority of her subtests since we started testing in fourth grade. Now that she has achieved post high school on all subtests, it seems unlikely we will see any growth data from these tests. The only information from this year that could really be considered new is an increase in her language skills. Previously her language percentiles were in the mid 90's. This year it joined the growing group of 99th percentiles. At least our change in language studies has had an effect, maybe. Or is it just a change in the expected abilities of children her age? Clearly the tests no longer give us any real data to use as a guide for Amber's future education. The tests simply tell us that Amber is still who she has always been, despite the chronic illness. She has to fight harder for her understanding of the topics some days, but apparently it's still all sticking in that brain of hers. It seems pointless to waste the time and money on a test that has no real purpose for us, yet having full testing records through eighth grade gives a sense of completeness. Amber doesn't mind the tests, she actually finds it enjoyable because it's pretty easy for her. Amber also likes seeing that she's still doing well, but I don't want her to define her abilities based on the results of a test. We struggle with that aspect every single year. So, what does this all mean for eighth grade? Do we continue administering the standardized tests? Do we scrap the testing and give her a year off before preparing for the PSAT and eventually the ACT? What do the tests mean anyway since much of it is not what she covered in the current grade? Are we testing her ability to retain knowledge over multiple years or are we testing her ability to reason and learn? I don't actually have the answer to any of the multitude of questions. I do know when the test results came this year we spent far less time than ever going over the results. Her dad and I looked them over, shrugged and showed the results to Amber. Other than now wondering whether we test in the future, the standardized tests had little impact in our lives. Do you have thoughts or comments on testing? Let me know. First off I would like to say congrats to Amber for being in the 99th percentile for multiple years now! That is just amazing and goes to show that her little brain is working and that is one smart cookie!! It also goes to show that you are a wonderful teacher! Now as an outsider looking in... or "reading in" from what you are telling us, you don't need to test her anymore. She's not a little child that still needs to be prepped and educated to learn the crucial subjects that she will take with her in life. She has already mastered that. She is beyond that now and because she retains her information well and knows the basic core subjects.. she is able to excel in most anything you sit down with her and try to teach her. She will grasp the lesson and maybe have a few questions along the way but she'll get it. She's smart. No need to drive yourself crazy wondering "should I test or not?" because you got your answers on this last test. She is post high school. She is learning. She is bright and smart. Her health issues weigh her down some days but it doesn't slow her brain up. It does not affect her thinking or way of learning/retaining information. I say that its safe for you to stop the tests, for now anyway. You said that you and your husband tested for yourselves, to see how well she was doing academically. Now you know. From here on out, she will only flourish and thrive because you already gave her the fundamentals and foundation she needed to jump start her learning. Good job Mom! Thanks for your thoughts Jo. We often second guess our educational choices, especially when there are days that Amber can barely string sentences together. I like how you explain it though. Because she knows her basics, she will grasp just about anything we take the time to explain. That's probably the best reason, right there, to end testing. She knows the basics and everything else will come. Thank you so much!